Occurs when bacteria builds up on your teeth under the gums, causing your gums to become red and swollen. This condition, known as inflammation, if left untreated, eventually results in damage to the ligaments and bone which hold your teeth in place, forming pockets around your teeth.As the disease progresses and these pockets become deeper, your teeth can become loose and fall out. Dentists and registered dental hygienists can tell how severe a patient’s periodontitis is by measuring pocket depth and reviewing patient x-rays. Arestin, which contains a potent but low-dose antibiotic (minocycline 1 mg) is administered locally, directly into the infected pockets between your teeth. A trained dental professional can administer Arestin after scaling and root planing, a common procedure used to treat periodontal disease. When used together with scaling and root planing, Arestin significantly reduces the depth of infected pockets and helps prevent disease progression. A combined therapy of Arestin plus scaling and root planing is more effective at fighting periodontal disease than scaling and root planing alone. Arestin has been shown to be particularly effective in the more difficult to treat patients, i.e. those that are at a higher periodontal risk such as smokers or people who have cardiovascular disease. Arestin was studied in more than 920 patients with adult periodontitis at 22 universities and dental schools across the country. These large clinical trials allowed for the collection of extensive data establishing the safety and efficacy of Arestin. Minimal side effects were reported and those that were reported were similar to placebo. In these trials Arestin did not alter taste, stain teeth, or cause upset stomach. Scientists have discovered that there is a genetic link to periodontal disease. If members of your family have had this disease, you should discuss it with your general dentist or periodontist. The chemicals in cigarette smoke have been shown to cause harm to the “helpful” bacteria that keep your gums strong. Cigarettes also lower HDL or your “good cholesterol,” which can lead to artery damage and decreased flow of nutrients to your gums. If you are a smoker, it’s probably a good idea to try and quit. Diabetics are at higher risk for developing infections, including periodontal disease. These infections can impair the body’s ability to process and/or utilize insulin, which may cause your diabetes to be more difficult to control. Diabetes may also have an impact on the infections that cause gum disease. Research has shown that the bacteria that cause periodontal disease can be transmitted through intimate contact such as kissing, or sharing a toothbrush. If you have had a relationship with someone who has symptoms of gum disease, you should bring this to your dentist’s attention. As you probably already know, stress is linked to many serious health conditions. What you may not know is that stress is also a risk factor for periodontal disease. Research demonstrates that stress can make it more difficult for the body to fight off infection, including periodontal diseases. Oral contraceptives, antidepressants, and certain heart medicines can affect your oral health. Just as you notify your pharmacist and other health care providers about all medicines you are taking and any changes in your overall health, you should also inform your dental care provider. Has anyone ever told you that you grind your teeth at night? Clenching or grinding your teeth can put excess force on the supporting periodontal tissues of the teeth and can speed up the rate at which they are destroyed. As you may already know, a diet low in important nutrients can compromise the body’s immune system and make it harder for the body to fight off infection. Because periodontal disease is a serious infection, poor nutrition can worsen the condition of your gums. If you find it difficult to maintain a well-balanced diet, a good nutritional supplement should be considered. Your teeth and gums are supplied with nutrients by your vascular system. Recent studies have shown periodontal disease may be both a cause and a symptom of cardiovascular disease. Bacteria are certainly a cause of gum disease, and it is important to remove bacteria to improve gum health. Bacteria, however, are not the direct cause of gum and dental bone tissue damage and eventual tooth loss. Gum and bone tissue damage are actually caused by the body’s own defense against bacterial infection. How could this be? Well, as a natural infection-fighting mechanism, your body sends white blood cells to the infection site. One of the functions of the white blood cells is to release enzymes to facilitate the passage into the gum and bone tissue. Once there, the white blood cells will destroy the bacteria. In periodontitis, however, there is an overproduction of these enzymes by these cells — an overproduction that results in a greater destruction of the gum and bone tissue than the body can repair or replace. Therefore, treatment of periodontitis involves a two-pronged approach: reduce the bacteria in the tooth pockets (the space between the gum and tooth) with a deep cleaning (known as scaling and root planing) of the teeth, and reduce the activity of the enzymes released in the gum tissue with Periostat®. Extensive studies have shown that when used with scaling and root planing, Periostat® significantly improved the results of this deep cleaning procedure and helped to stop progression of the disease better than scaling and root planing alone. fit together when you bite. teeth and jeopardizing your health. You Can Help Prevent Gum Disease! Does smoking increase my risk? The American Dental Association recommends that you floss at least once every day. Flossing helps stimulate your gums to rebuild themselves. Also, by scraping away plaque and other material, flossing stimulates your body’s immune system to take care of any invading bacteria, thereby elping to keep gums healthy. A healthy diet helps your body stay in top physical condition. If you do not eat well-balanced meals every day, you may be missing important nutrients that your teeth and gums need to fight invading bacteria. Talk to your dentist or physician about how you can improve your diet for peak physical condition. If you are concerned that any of these factors could use improvement, call your general dentist or periodontist today for a checkup. Your health care provider will be better able to help you if you come to his or her office prepared with a list of things to discuss. Periodontal Treatments for Periodontal Disease. Today there are several ways in which dentists and periodontists are helping patients overcome periodontal disease. Old and new therapies used together often help dental professionals address the various factors that contribute to periodontitis. Ultrasonic Therapy: This procedure uses an instrument that directs ultrasonic vibrations through the gums and teeth. Similar to gum irrigation, this procedure strengthens tooth and gum stability and encourages your own immune cells to destroy harmful bacteria. Scaling and root planing is a type of professional tooth cleaning. It removes plaque and tartar from the teeth and smoothes the root surfaces. It is well established that many cases of periodontal disease are caused by bacteria. That’s why antibiotic therapy is widely used today to help eliminate these harmful bacteria. This treatment includes oral medication, locally applied antibiotics, such as ATRIDOX® (doxycycline hyclate) 10%, and rinses that can help fight bacterial infection. When periodontitis progresses deep enough in the gum and tooth, a specialist called a periodontal surgeon sometimes needs to perform surgery to repair the gum. He or she uses various surgical techniques to repair the damage. Surgery may be done on soft tissue or bone to help the healing process. On your next visit to the dentist, let your dentist know that you care about the condition of your gums as well as your teeth. If it helps, write down the questions you want to ask. Remember, a healthy smile begins with healthy conversation. Do my gums look healthy? Did my gums bleed during this exam? Have any spaces formed between my gums and my teeth? Are any of my permanent teeth loose or separating? What steps can I take to achieve healthy gums? Should I schedule an appointment with a periodontist? Treatment with Arestin® (minocycline HCl 1mg) microspheres is fast, easy and doesn’t cause discomfort. Treating periodontal disease with Arestin and scaling and root planing will help you manage chronic periodontist more effectively than scaling and root planing alone. You’ll also be less likely to lose your teeth. Why is Periostat®(doxycycline hyclate) prescribed for periodontitis? Most treatments for adult periodontitis focus primarily on reducing the number of bacteria on the surface of your teeth. For example, your dental professional is likely to perform SRP (scaling and root planing) to help reduce surface bacteria. This is an important part of your treatment because periodontal disease begins with a bacterial infection on the tooth surface, and by reducing the number of bacteria, the symptoms of periodontitis (such as bleeding) can be reduced.Research has shown that it is also important to suppress your body’s overproduction of gum- and tissue-destroying enzymes. This is where Periostat® comes in. It is the first medication that works by reducing the activity of the enzymes that destroy tooth and gum tissue.Periostat® is available by prescription only from your dentist or periodontist and should be taken in conjunction with SRP delivered by your dental professional to reduce pocket depths and improve clinical attachment levels. Don’t take Periostat® if you are pregnant or breast-feeding, as it may cause harm to your unborn child or infant. Don’t take Periostat® if you are allergic to tetracycline antibiotics. In clinical trials, adverse reactions to Periostat® were similar to reactions from taking a placebo. Periostat® is available as a tablet to be taken twice daily, about an hour before or two hours after meals. Periostat® should be taken with plenty of fluids. If you forget to take a dose, just take the normal dose of 1 tablet at the next scheduled time. Do not double up to make up for the missed tablet. The duration of Periostat® therapy is different for each person and depends on the severity of your gum disease and the time needed for your body‘s healing process to take place. During your checkups, your dentist or periodontist will determine if you should stop therapy or continue to take Periostat® based on your response to treatment and the level of improvement of your gum disease. In clinical studies, Periostat® was shown to be safe when taken for as long as 12 months. Typically, the drug is taken for periods of no less than 3 months. Your dentist or periodontist will tell you how long you should take Periostat®. Periostat® is a unique dosage of a drug called doxycycline. The dosage of Periostat® differs from that of doxycycline used to treat infections. Exceeding the recommended dosage may result in an increased incidence of side effects, including development of resistant microorganisms. At all times, follow instructions given to you by your dentist or periodontist. Make sure you keep appointments for treatments and checkups. Between visits, follow good dental hygiene as recommended by your dental professional. 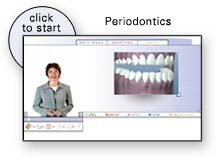 If Periostat® has been prescribed for you, make sure you take it as directed by your dentist or periodontist. Yes, Arestin plus scaling and root planing is an effective treatment for periodontal disease compared to scaling and root planing alone. >Clinical studies show that patients who received a combined treatment of scaling and root planing and Arestin maintained healthier gums and pockets versus those who were treated with scaling and root planing alone. Dentists and registered dental hygienists can tell how severe a patient’s periodontitis is by measuring pocket depth and reviewing patient x-rays. As periodontal disease progresses and these pockets become deeper, your teeth can become loose and fall out. uses microsphere technology that delivers minocycline, a potent but low-dose antibiotic that kills the bacteria that cause periodontal disease. of sand and look like a yellow powder to the naked eye. Administered as a powder, the microspheres become moist from various fluids beneath the gums, they stick to the infected sites around your teeth. The moisture causes the release of the antibiotic minocycline, which can then access the bacteria in the intricate sites around your teeth, including the sites that are difficult to reach with other methods of treatment. The different sizes of the microspheres enable the medication to be continually released and fight the infection for at least 21 days. This helps control periodontitis for at least 12 months when used with SRP. Arestin is administered quickly and easily. Application is comfortable and no anesthesia is needed. Arestin does not require bandages and won’t leak or fall out or leave anything to be removed by your dentist. Plaque and Calculus are present. Pockets are usually 4mm or more. Pockets are 3 mm or less. Inflammation and bleeding is usually present. After Scaling and Root Planing of the tooth. Plaque and Calculus are removed. Leaving a CLEAN tooth surface. Arestin® microspheres are placed in the periodontal Pocket. The Microspheres carry the antibiotic minocycline. The mocrospheres are actively releasing the minocycline up to 14 days. The microsphere are completely resorbed on there own. Follow up visits will reveal no bleeding upon probing. No inflammation in most cases. No bleeding in most cases. Periodontal disease is a chronic bacterial infection, and like most bacterial infections, can be treated with an antibiotic. Dentists and hygienists typically treat periodontal disease with a procedure called scaling and root planing (SRP). SRP is a non-surgical procedure that involves a deep cleaning above and below the gum line in order to remove plaque that accumulates on the tooth. The root is then planed until it is smooth to eliminate plaque deposits on the root that can breed bacteria. Although SRP is effective at removing plaque build up, it doesn’t eliminate all the bacteria that cause periodontal disease. Adding Arestin® (minocycline HCl 1 mg) helps eliminate the remaining bacteria.Periodontal disease is a chronic bacterial infection, and like most bacterial infections, can be treated with an antibiotic. Dentists and hygienists typically treat periodontal disease with a procedure called scaling and root planing (SRP). SRP is a non-surgical procedure that involves a deep cleaning above and below the gum line in order to remove plaque that accumulates on the tooth. The root is then planed until it is smooth to eliminate plaque deposits on the root that can breed bacteria. Although SRP is effective at removing plaque build up, it doesn’t eliminate all the bacteria that cause periodontal disease. Adding Arestin® (minocycline HCl 1 mg) helps eliminate the remaining bacteria. My dentist is already using scaling and root planing to treat my periodontal disease. How can Arestin® (minocycline HCl 1 mg) help? Arestin used in conjunction with scaling and root planing is more effective at fighting periodontal disease than scaling and root planing alone. Scaling and root planing cleans the gums and therefore helps combat gum disease. However, scaling and root planing doesn’t get deep into the infected site and can’t kill all the bacteria which causes periodontal disease. Administered directly into the infected pocket, arestin kills the bacteria that scaling and root planing can’t reach. The clinical trials for Arestin® (minocycline HCl 1 mg) microspheres were large and well controlled. These studies were conducted at 22 universities and dental schools across the United States in more than 920 patients with adult periodontitis.In these clinical trials, patients treated with Arestin plus scaling and root planing (SRP) had significantly reduced pocket depth compared to those treated with SRP alone. Pocket depth is a measurement that is used to diagnose and monitor the severity of periodontal disease. Pockets are formed around teeth when supporting tissue and bone is destroyed. Because the severity of periodontal disease is measured in part by the depth of pockets, a desired outcome in periodontal disease treatment is the reduction of pocket depth. In addition, clinical trials showed that 25 percent more patients treated with a combined therapy of Arestin plus SRP as compared to SRP treatment alone, reduced their pocket depth below 5mm, restoring their dental health to a point that can be more easily maintained.The trials also showed that Arestin used with SRP was particularly effective in patients with cardiovascular disease and patients who smoke. Arestin was also effective in more difficult to treat teeth such as molars and in challenging to treat sites that occur between tooth roots know as furcations. Typically, molar teeth and their furcation sites in particular are hard to clean with the scaling and root planing procedure because of their shape and location in the mouth. Arestin is easy to apply, allowing dentists to reach these harder to treat sites and because Arestin is so adhesive, the antibiotic remains in these difficult to treat areas and kills the infection for a long period of time. Arestin can be administered quickly right after scaling and root planing, which allows patients to address all of their oral health needs in one brief visit.In addition, studies show that there is a possible link between periodontal infection and cardiovascular disease, diabetes, osteoporosis and increased incidence of pre-term, low-birth weight babies. These added risks makes early diagnosis and treatment of periodontal disease even more important. Following treatment for periodontal disease using a combination of Arestin® and scaling and root planing (SRP), you should continue to take care of your gums and mouth by practicing good oral hygiene, brushing three times a day and flossing regularly. After treatment, avoid eating hard, crunchy, or sticky foods for one week. You can resume your normal oral hygiene routine 12 hours after treatment. To maximize the results of your treatment, speak to your dentist and follow these recommendations. Avoid touching treated areas.Wait 12 hours after your treatment before brushing teeth. Gum disease can recur and needs to be checked regularly. Be sure to return for your follow-up appointments. Periodontitis is a chronic disease and needs to be checked regularly. Be sure to return for your follow-up appointments.